David Burson, 47, of Lumpkin County passed away at his home on Sunday March 10, 2018. 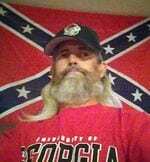 David was a professional commercial roofer, a fan of NASCAR, the Georgia Bulldogs, the Atlanta Falcons, and he enjoyed skydiving, floating on the river, and the NRA. (He was always pushing the limits.) He lays behind a legacy of being kind, loving, and respectful to his beautiful wife (his baby) and his son David always honored his mom and dad. David showed love and respect to all his brothers and sisters. He was the Tickle Monster to a host of nieces and nephews. David was preceded in death by Larry McKinney Burson. Surviving David are his wife, Melissa and son, Adam, of Lumpkin County, mom and dad, Donald and Elizabeth Holland, of Dawson County; sister Jenny Burson, of Lumpkin County; brother, Doug Burson of Lumpkin County; brother and sister; Bo and Bonnie Holland, of Dawson County; brother and sister, Dustin and Dana Holland, of Dawson County; brother and sister, Dano and Katherine Holland, of Dawson County; brother and sister in law, Kelly and Lynn Bryant, of Fayetteville; sister in law, Robin Kelley, of Ball Ground and a number of aunts, uncles and cousins from North Georgia. 2nd Samuel 12:23: Someday we will join him in death, he can’t come back to us but we can go to where David is. The family will receive friends Thursday from 10 a.m. until 8 p.m. at the funeral home.